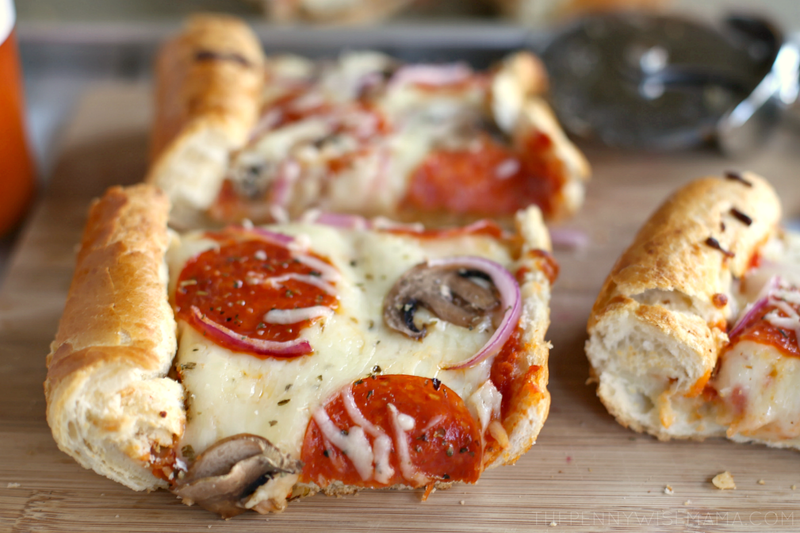 This recipe for French Bread Pizza is so simple and delicious. Ready in under 30 minutes, it is perfect for busy school nights and lazy weekends. Read on to find out the secret ingredient that makes it so delicious and unlike any French bread pizza you’ve ever had! With work, the kids’ sports practices and homework, I don’t have a lot of time to spend in the kitchen cooking dinner each night. I need meals that are quick and easy to prepare that are also delicious and at least somewhat healthy. Pizza is definitely a go-to meal for us (we all love it) but I rarely make it from scratch because it is too time-consuming. This is where French Bread Pizza comes in to save the day. This yummy and incredibly easy meal satisfiesyour need for pizza, while hardly taking any time to prepare. Minus the veggies needing to be cut up, everything is already prepared, so all you have to do is put it together and bake it in the oven. In less than 30 minutes, you have pizza that is full of flavor that the whole family will enjoy. The secret to this pizza being so delicious and full of flavor lies within the sauce. I used Mezzetta Marinara Sauce, an all natural marinara sauce made with real, fresh ingredients and the world’s best tomatoes — hailing from the rich soils of Italy’s San Marzano region. While there are a handful of different flavors to choose from, I chose Caramelized Onion & Butter, which turned out to be a great choice. The flavor was incredible compared to your typical pizza sauce. 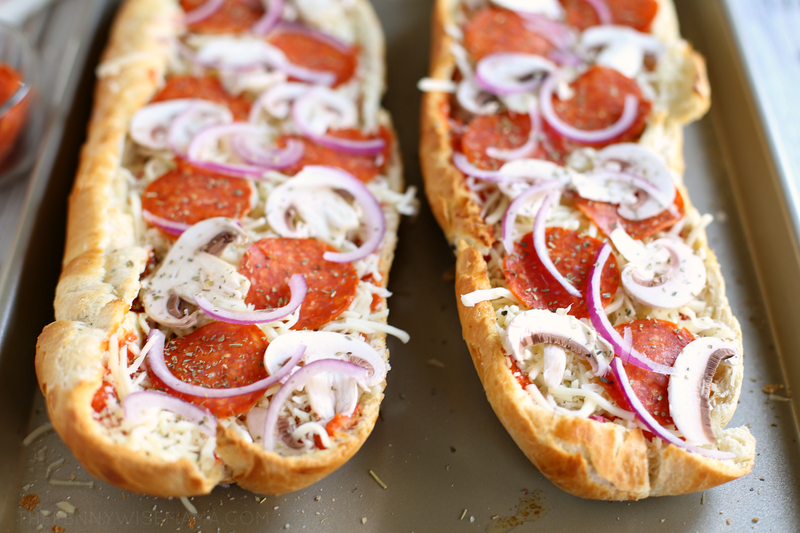 It gave our simple French Bread Pizza so much flavor! This pizza can be prepared in just a few simple steps. 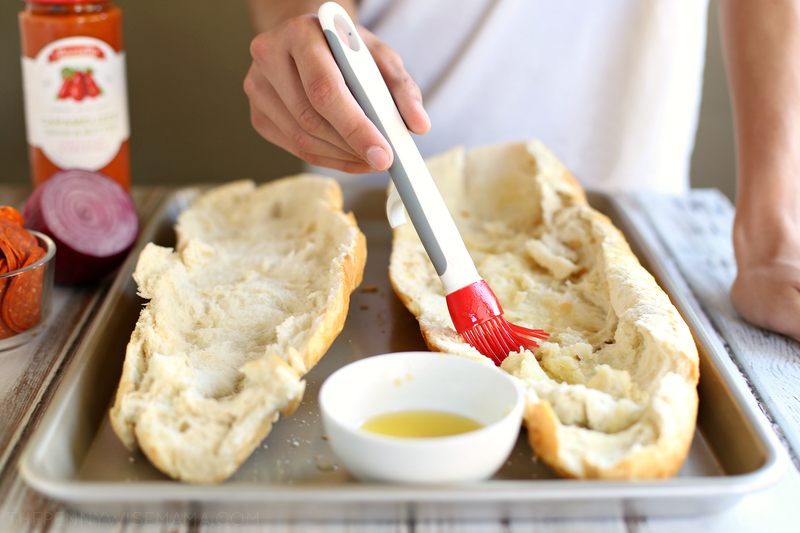 The first thing you will need to do is cut the French bread in half lengthwise. Then top with garlic butter and bake for 5 minutes to allow the inside of the bread to get crispy before you add toppings. This step is key, otherwise the inside of the bread will get soggy. 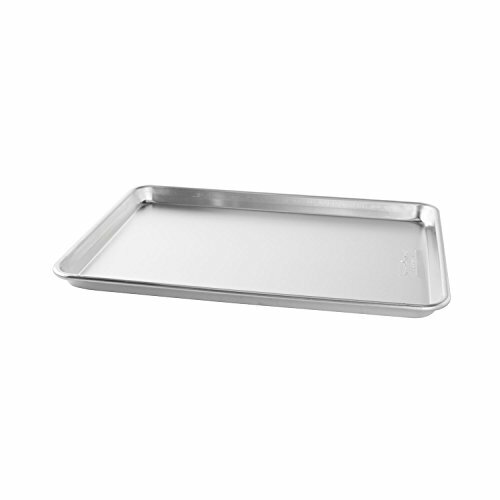 Baking Tip: You’ll definitely want to make sure you use an aluminum baking sheet, like this one from Nordic Ware. It’s large enough to hold both halves of your french bread at the same time and the raised sides will help prevent your bread from slipping off. It’s made really well and it’s actually non-stick, making cleanup a breeze. It’s also guaranteed to be rust-free for the lifetime of durability. After you’ve toasted your bread in the oven, remove it and add your sauce and toppings of choice. Then pop it back in the oven to bake for another 10-12 minutes to melt the cheese. That’s it! The best part about this meal is you can easily customize it to make everyone happy. If your kids don’t like all the toppings, you can easily make one half just sauce and cheese. I topped ours with sauce, pizza cheese, mushrooms, red onions and a little Italian seasoning for extra flavor. So yummy! 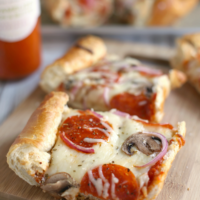 This recipe for French Bread Pizza is so simple and delicious. Ready in under 30 minutes, it is perfect for busy school nights and lazy weekends. 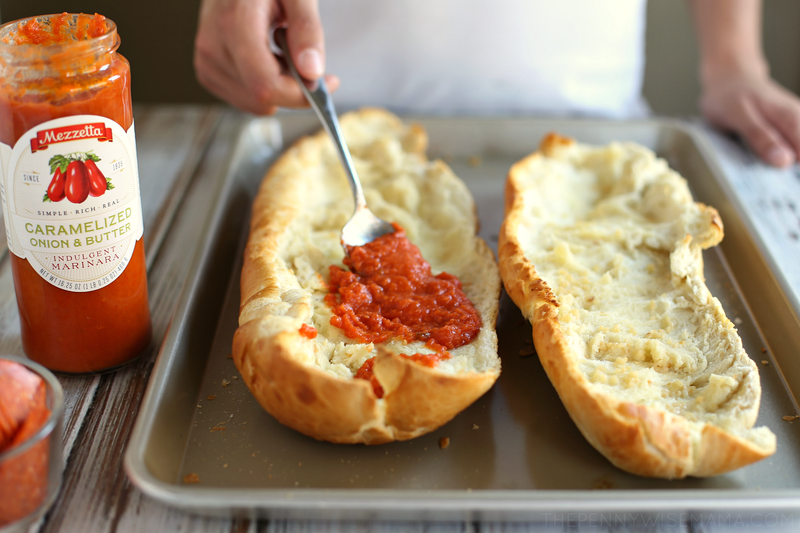 Read on to find out the secret ingredient that makes it so delicious and unlike any French bread pizza you've ever had! Cut bread in half lengthwise and place cut side up on a large baking sheet. In a small bowl, combine butter and minced garlic. Using a basting brush, coat each half of bread with garlic butter mixture. Bake for 5 minutes. While the bread is baking, cut up your veggies and get your toppings ready. Remove bread from oven and top with marinara sauce, cheese, pepperonis and veggies to your liking. Sprinkle with Italian seasoning. Bake for 10-12 minutes. Remove from oven and let cool for 1-2 minutes before slicing into pieces. You can discover more delicious Mezzetta recipes here. 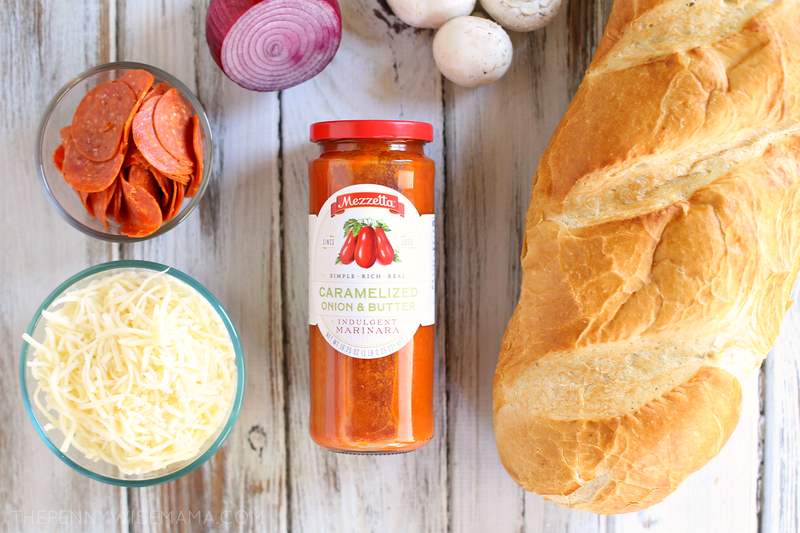 Have you tried Mezzetta marinara sauce or pizza sauce? I havent tried this brand of pizza sauce yet. We really like making french bread pizzas in the toaster oven. I like how you can make all kinds of combinations. Yours looks delicious. looks yummy havent seen the sauce brand before so will go find them on facebook. I saved this pizza recipe to pinterest and I am going to make it. It is easy and looks so delicious! Thanks for sharing. This looks super yummy. I make this often but never thought to bake the bread first. I will have to try this using the Mezzetta Marinara Sauce. Pepperoni and mushrooms are two of my favorite pizza toppings! I would love to give this a shot with some black olives too! I love the flavor of caramelized onions so I want to try this. Thanks. My family loves pizza, so this looks like something I really should try! Do you take out the bread in the loaves after cutting length wise ? I was going to ask the same question because when I cut a loaf in half it sure does not look like the one in the photo. Mine looks flat and even and “yours” looks gutted! This looks so good! I want to make it! That looks so good. I’m on a diet right now but I need a cheat day very soon, lol. Pizza would be really nice! 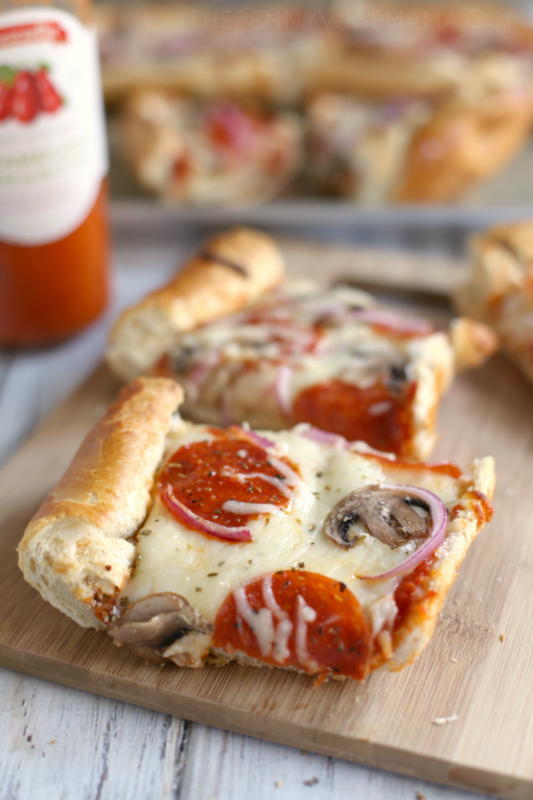 French bread pizzas are one of my very favorite quick dinners. I love that I can throw everything together and have a delicious, warm meal on the table in under 25 minutes. I think these pizzas would be the perfect meal for a big crowd. Thank you for sharing this amazing recipe. This looks even better than Stouffer’s! Haha, thanks! 🙂 The pizza is completely customizable, so you can definitely add more meat or change up the toppings if you want. I love Mezzetta sauce, but any marinara or pasta sauce will do! This is terrific sauce and no kidding you can really tell the difference between it and other sauces. I love it on pizza – it has a deeper flavor than most. 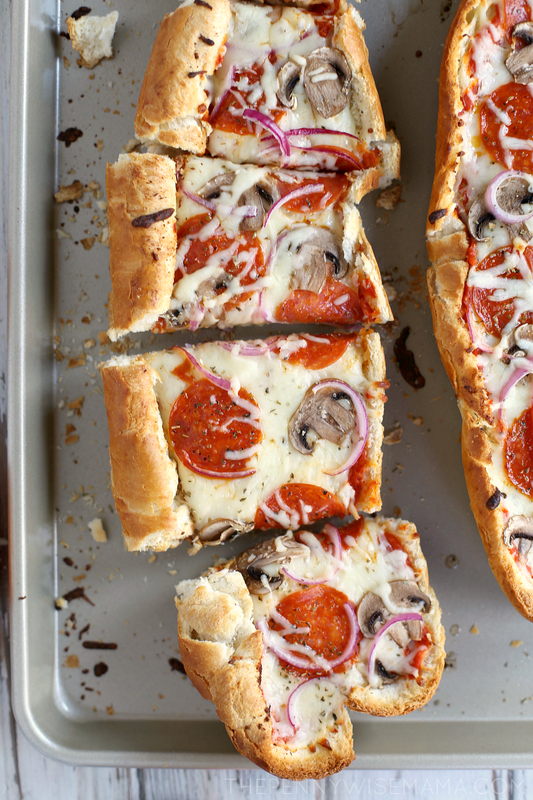 This french bread pizza looks terrific! Diet? What diet? That looks too good to pass up! Easy and delicious thank you!